Taiwan was formerly known as Formosa. Pingxi Sky Lantern Festival, Yanshui Beehive Fireworks Festival, Jinshan Fire Fishing Festival, Biennial Butterfly Beauty Festival are some of the most popular festivals in Taiwan when flowers are sent in abundance. Plum Blossom (Prunus Mei) is the national flower of Taiwan. Pink & White Roses, Orchids, Phalaenopsis, Red Anthodium and White Lilies are some of the popular choices for flower gifting in Taiwan. People in Taiwan gift flowers on Chinese New Year, Weddings, Births and Funerals. If possible do not gift handkerchiefs, clocks, and umbrellas to Taiwan. Send flowers same day to Taiwan using our local florists & flower shops. Order by 12 noon. Send Easter Flower Arrangement, Easter Hampers & Gift Baskets to Taiwan. Send Roses, Carnations, Lilies throughout Taiwan for occasions like Birthdays, Anniversaries, Funerals, etc. Enjoy affordable flower delivery across Taipei, Kaohsiung, Taichung, Tainan & nationwide delivery. How do i send International Flower Delivery to Taiwan? 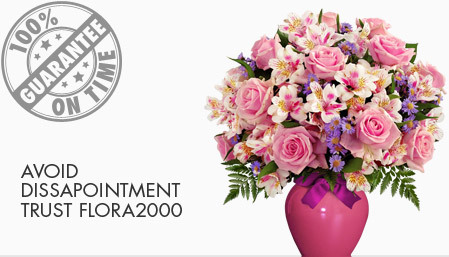 Flora2000 has transformed International flower delivery to Taiwan into a fine and effortless art. With our efficient flowers & gifs delivery services worldwide; you are sure to find the perfect expression of your message to your loved ones. Be it Roses, Lilies, Carnations or Cakes, our gifts are sure to make both the sender and the receiver happy. We make sure the gifts you give reflects what you feel about the receiver. Taiwan is formerly known as Formosa and is located to east of mainland china. It’s a highly industrialize country. Taiwanese Mandarin is the official language of Taiwan. Pingxi Sky Lantern Festival, Yanshui Beehive Fireworks Festival, Jinshan Fire Fishing Festival, Biennial Butterfly Beauty Festival are the most popular festivals in Taiwan. Avoid presenting things which are made locally. Eight is the luckiest number. Plum Blossom (Prunus Mei) is national flower of this country. Pink & White Roses, Orchids, Phalaenopsis, Red Anthodium and White Lilies are some of the popular choices for flower gifting in Taiwan. Giving eight of something brings luck to the recipient. People in Taiwan give gift on Chinese New Year, weddings, births and funerals. If possible do not gift handkerchiefs, clocks, and umbrellas to Taiwanese. We have an exclusive collection of flower arrangements, hampers & baskets for this Easter. Our classy collection of flowers & Gifts for Easter to Taiwan.